Switch boxes come in many types, materials and sizes, and selecting the right one for the job can sometimes be confusing. This tutorial will explain about the most common types of metal electrical boxes used in new work construction. Metal electrical boxes are required if the conduit and metal box system itself is used to ground the electrical circuit. Each type of box has its own characteristics and reason for being used which will be reviewed in this tutorial. To learn about old work or renovation electrical boxes, see How to Install an Old Work Electrical Box in an Existing Wall. 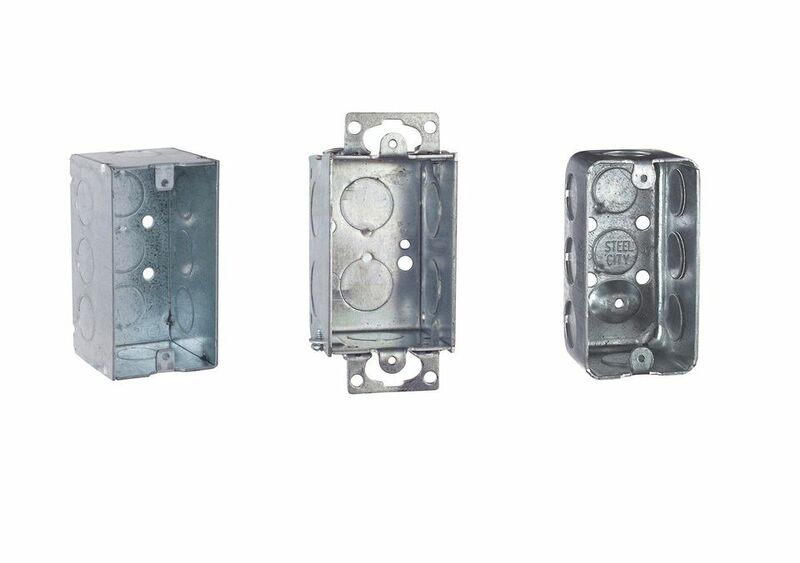 A gangable switch box is a modular box having removable sides allowing a single box to be expanded into a 2-gang, 3-gang or 4-gang box holding multiple devices. The boxes are characterized by removable sides having a screw at one end, and on the other end, a tab that interlocks the removable side with the box body. The orientation of the screw and interlocking tab flip from the left side of the box to the right side of the box. In other words, the screw will be on the bottom left side as in this picture, and also will be found on the top right side of this box. With gangable "new work" boxes, holes are provided in the side panels at the back of the box for nailing the box to the wood stud if used as a single gang box. Sometimes these new work boxes will come with a tab or bracket attached to one side for fastening to the wood stud when using box in single or multiple gang box configurations. This type of box is a utility box sometimes called a "Handy Box." It can be used for switches, outlets or can be used as a small junction box. Its body is made from one piece of cold drawn or stamped steel and cannot be ganged. These boxes are intended for use in exposed construction and are most often surface mounted and used with conduit. Although these boxes look similar to a gangable box, they are very different. 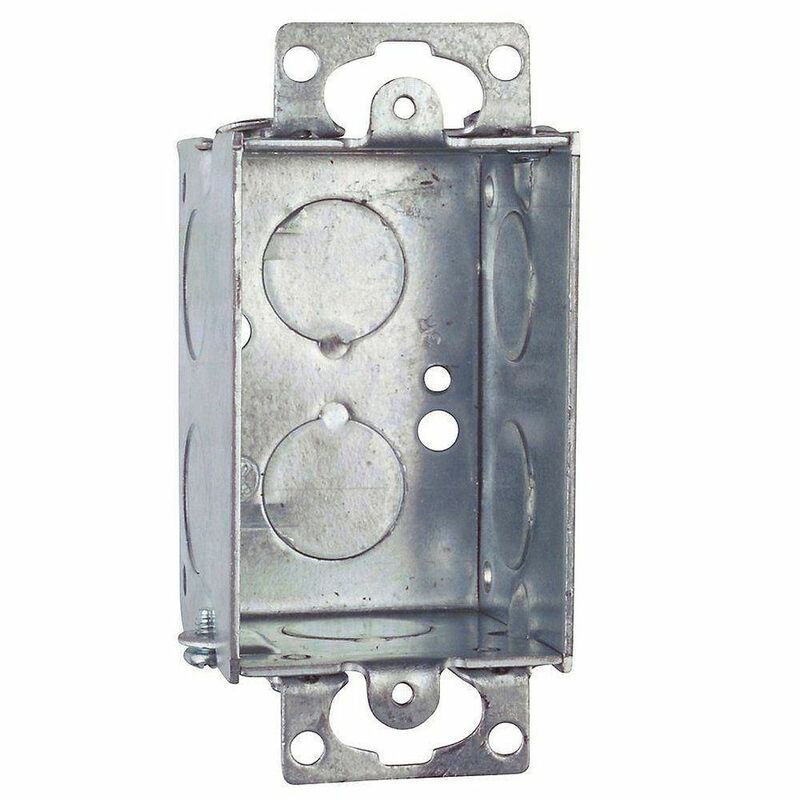 These non-gangable switch boxes are made from flat steel plates and may have interlocking tabs and/or spot welds holding them together. They cannot be taken apart and are not gangable. They are available in single gang, 2 gang, 3 gang or 4 gang box sizes. Two holes are usually found at the back of the box for nailing the switch box to the stud. Sometimes these new work boxes will come with a tab or bracket attached to one side for fastening the box to the wood stud when using box in single or multiple gang box configurations.